You go to Disney on Ice. Don't think I'd ever been to one of these things before I accompanied Rachel's family and toddlers Jackson and Julia last night to 1st Mariner Arena (proud home of the indoor soccer Baltimore Blast). Although I can't remember if I actually saw Sesame Street Live on Ice when I was a kid. Saturday evening's show could have used more of Disney's classic songs. But it was still pretty entertaining, mainly because the kids loved it, even at the probably too-young ages of 2 and 1. 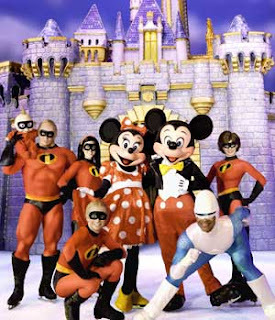 The plot was heavy on The Incredibles' family teaming up to find Mickey and Minnie, who have been kidnapped by pirates and others in a Magic Kingdom gone haywire. Or something like that. But I suppose the plot (and sloppy falls by Dad and Daughter, always my deviously favorite part of ice skating) were beside the point. Disney's stories and characters have a mostly strong record. Call me old school, but my favorites are still Snow White and the Seven Dwarves and The Jungle Book.